You live in a stranger’s home. They are kind to you, but you can never forget it is their good will alone that keeps you here. It’s better than the street. Some days you stay in bed until 2pm, because it’s not like you have anything else to do. 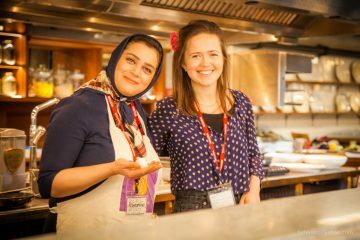 You eat food bought by your host, you cook meals, clean and take the bins out – because it’s the only thing you have to give back. You have no money. It all went to the first solicitor. The one who said he could win your case, until the money ran out. You are ashamed you cannot provide for yourself. You know a charity that gives you £25 a week. £21.20 of it goes on a weekly bus pass. You go to church. Sometimes you feel it is only your faith in something, anything, that has kept you sane. You go to a therapist, through another charity. Bit by bit, you process what has happened to you. You grieve for what and who you have lost. You chip away at the traumatic things that happened along the way. The violence. The exploitation. A meeting with your solicitor today. You had to go through your story. Again. You tell it, wondering which part won’t match this time. You get angry thinking about the first time. You were interviewed but you couldn’t understand much, you wanted to forget it all, but they were relentless. You volunteer at a nursery. Spending time with the children allows you to forget, just for a time. They don’t ask you where you have come from. You are not different. They just love you. You get panic attacks when it gets close to your day to sign on. It is minus 2, sleeting and windy, but you wait on the pavement for hours to be seen. The alternative is detention. You’ll join the 2,000 people already there. There’s no guarantee they won’t detain you anyway. They call it the hostile environment for a reason. Every day you think about your baby. The one you lost this time last year. You were housed by the Home Office then, but after he died you were evicted. Because it affected the grounds for your case. 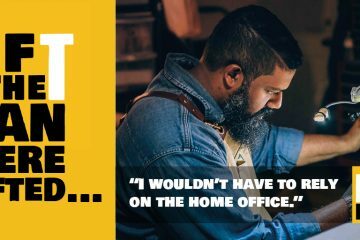 A letter from the Home Office – they don’t believe a different part of your story. You have to find evidence. You work for months to find it. They say it’s fake and demand witnesses. You find witnesses. Silence again. More waiting. The days pass, weeks, months, years even. Some days you are hit by the waste of it. You had a job before. A career. A degree. Worthless here. You are allowed to study, but you aren’t allowed a loan. You came here because you had no choice. It cost you your country, your home, your dignity, your freedom, your family, your friends, your job, your baby. The UK government says you cannot work. The UK press say you are a burden, a drain on public funds. A lie made a reality by government policy. You say LET ME WORK. Give me dignity. Give me freedom. 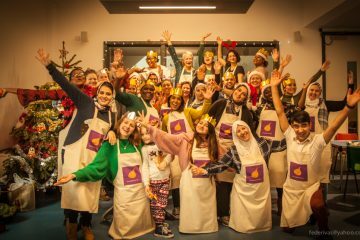 This isn’t the story of one person, it is the collective experience of asylum seekers who come to the UK. Not many are lucky enough to be hosted. For individuals, their lives are bleak variations on the same theme. ‘Asylum seeker’ and ‘refugee’ are just labels that make the nightmare of these people’s lives somehow more palatable, sanitised and less relatable for the general public. They are not other, they are us. Would you accept the same for yourself, a friend or your family? This is our petition, for a basic human right: the right to be allowed to work. Our chefs have talent and passion. They deserve the opportunity to thrive, not to barely survive. Our hope is by telling the real stories offered by our Migrateful chefs, that you will understand the reality of what they are forced to endure. Without the right to work, they are without dignity and purpose, they struggle with their mental health, and they feel like a prisoner in almost every way – and if they get detained, they get the bars too. The full set. Fun Fact – the Home Office have the power to detain people without a statutory time limit. These brutal, uncaring and calculated decisions by the Home Office force already vulnerable people very effectively into destitution. They are barred from participating in the economy, the most effective means they have to help themselves. Instead they are relegated to rely on the humiliation of hand outs and the charity of others. The Home Office would tell you that they provide support for (eligible) asylum seekers – £37.73 a week and housing that has recently been condemned as unfit for human habitation. The World Health Organisation defines mental health as ‘a state of well-being in which every individual realises their own potential, can cope with the normal stresses of life, can work productively and fruitfully, and is able to make a contribution to their community.’ By that definition, the Home Office is guilty of forcing thousands of people into poor mental health. 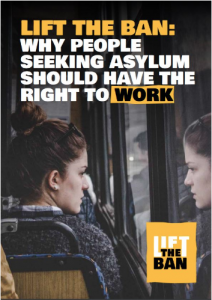 The LiftTheBan coalition are also calling for the ban on working to be lifted for asylum seekers whose cases have been pending for more than 6 months. They estimate 11,000 people would benefit immediately and that the UK economy could gain £42.4m per year. It’s wonderful that it makes financial sense, but the truth is, even if it cost us money – it would still be the right thing to do. If you are feeling powerless right now, that’s good – it’s because you care. N.B. Migrateful will be sharing more stories of asylum seekers people’s lives, in their own words. If you sign the petition you will be notified as these stories get published. Abeni our Nigerian chef (on the left) has been waiting 16 years to get her immigration status. All this time she has been unable to legally work. 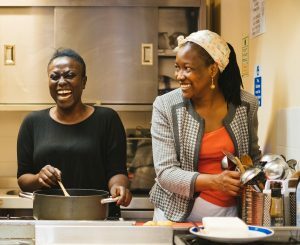 Sandra our Nigerian chef (on the right) was granted her status last year after waiting 8 years.